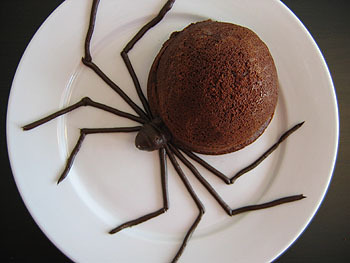 Not Martha created these amazing spider cakes that could be easily recreated with just a little bit of time in the kitchen, but if you are looking for something even quicker, skip the cake baking and replace it with a scoop of ice cream. The spider legs could be drawn with melted chocolate, but again go even easier and buy some store bought chocolate frosting. You can check out the spider cake tutorial over at Not Martha if you are in the mood to throw together something fun last minute.